The Texas Cowboy Reunion is one of the few events I visit each year. It’s always felt to me to be the closest to my imagined version of Texas when I was growing up in Southern California. But returning each year is a challenge when looking for something new to say. When that happens, I fall back to simply providing a sense of place for my reader. 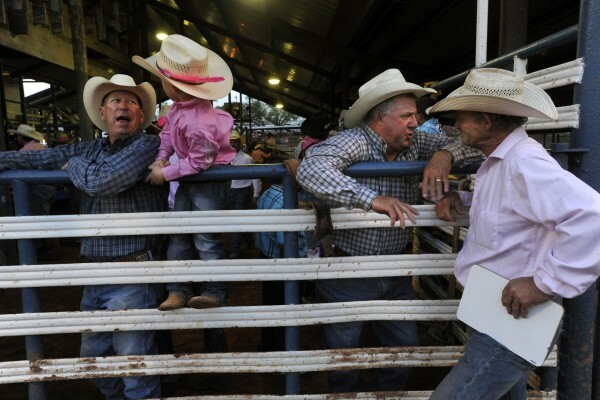 The photographs may differ from the text but even if they do, as a whole the package paints a larger image of the rodeo in the reader’s mind. This was published July 9, 2014. 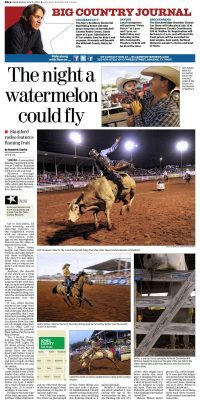 STAMFORD, Texas – I saw my first flaming watermelon at the Texas Cowboy Reunion last week. I’m wondering if I’ll ever see a second. Midway through Thursday night’s rodeo, Cameron Keeton killed a little time between events with a short skit. Because, you know, that’s what rodeo clowns do. Up to this point I’d been amusing myself shooting pictures of the roughstock events with my cameras and a slow-motion video app on my smartphone. You can see the video at reporternews.com. Yes, I know. 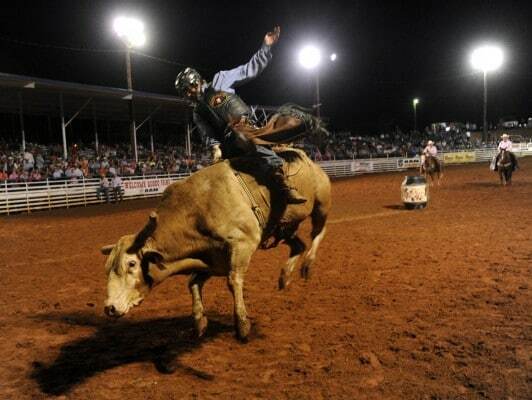 Some people call them rodeo clowns and some people call them bull fighters. The ones I’ve met didn’t mind what you called them, just so long as you didn’t call them late to supper. Anyhow, the details of the shtick are a little fuzzy to me a few days later. I recall there was a large steel pipe with four legs, its open end pointed skyward. I also recall one of the bull fighters, comically dressed in drag, carried the aforementioned watermelon into the arena. It was when Keeton balanced the large fruit on its end atop the open end of the pipe that I realized, possibly, that I may have been standing a little too close. I’ve watched R. Lee Ermey blow the rind out of enough watermelons on “Mail Call” to guesstimate the possible blast radius of an 8-pound Royal Sweet. Yes, I realize Thursday was “Not Too Tough to Wear Pink” night. I’m all about giving breast cancer the boot. But I’d rather have my shirt dyed pink before I put it on, not while I’m wearing it. I backed up a few feet and put a couple of other fellows between me and the melon. When the blast finally came, I think it was a little louder than what everyone expected. The melon pretty much vaporized before my eyes, I didn’t see a trace of rind or anything else. If it wasn’t seedless, it was now. Failing to find any sign of the fruit, my eyes slowly lifted. Others followed, and we observed the top of the fruit doing it’s best impression of Apollo 13 into the night sky. Yes, I had my camera. No, I have no photograph of this. Some things you just can’t take a picture of. Dumbfounded, I found myself staring along with everyone else, watching this flaming chunk as it gained altitude. Briefly I debated in my mind whether I was seeing the top of the watermelon on fire, or the flaming tail end of a rocket that might have been inside the steel pipe. I imagined the missile’s nose, poking out a skirt of green rind, trying its hardest to reach the stars. Then my ADD kicked in and I wondered what flaming watermelon tasted like. Meteor Melon didn’t get too far, unfortunately. It rose past the judges and arched over the metal roof covering the arena’s alley and pens, flaming out as it went. Where it landed, I know not. But I’ll bet one of those bulls back there learned what cooked watermelon tastes like.